I am trying hard not to get discouraged. The deer and rabbits apparently think they have found the area’s finest food emporium. They are playing havoc with many of the plants in my garden, but I must admit to being confused by their choices. 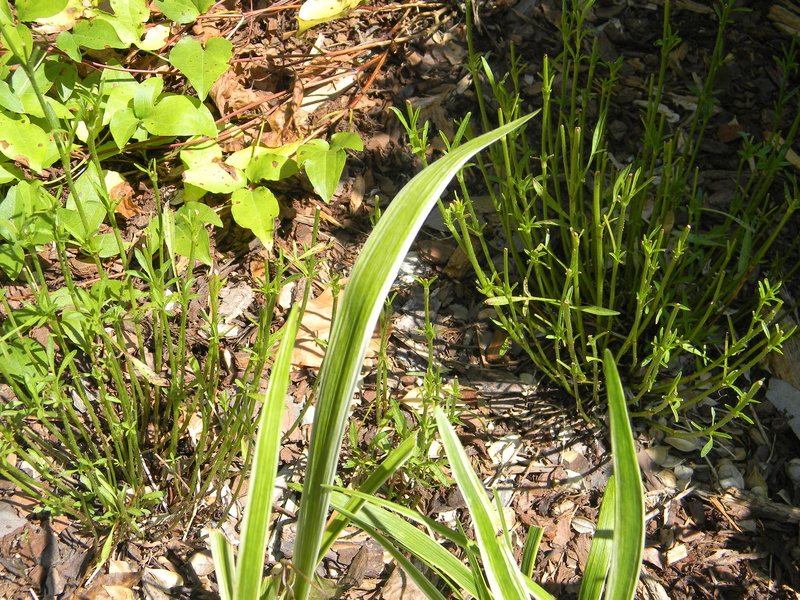 Here, for example, on the left is a planting of liriope that is untouched. Less than ten feet away, the rabbits are feasting on the same plants. And I was hoping to have a thick golden border edge there. What is it about the area on the right that has attracted that rabbit? What did I do correctly on the left and so wrong on the right? 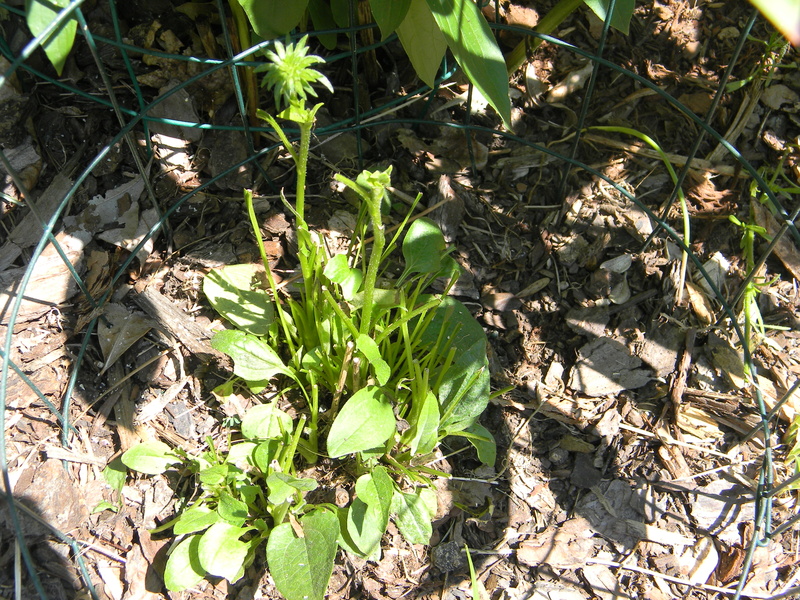 Here is a ‘Violet Flame’ phlox, in the ground only two weeks and untouched, and fifteen feet away one planted at the same time is completely scavanged. I have been looking for this shade of phlox for some time; imagine my disappointment to have finally located it and then seeing it become a dining treat for our local critters. The critters also ate a clematis right to the ground, leaving me to watch the top vines just turn brown. This is typical of my coneflowers–one flowering shoot left, and these were all encased in cages. I’m not optimistic about getting any blooms on them this year. The predator in this case must be a deer…or a very small rabbit. The ‘Creme Brulee’ Coreopsis verticillata was just ready to bloom when it was sliced down in half. The helpful critters left one bloom, just to tease me. I planted a dozen liatris bulbs in spring, and half of them were eaten to the ground by rabbits by the time they reached two inches. I’m still hoping to get a few blooms out of the remainder. Some of their earlier “leftovers” are beginning to put out new growth and (if left alone) will likely bloom later in the summer. That, of course, will require remedial action on my part for prevention. What is disheartening about all this is that the daylilies are just opening, and I’ve already seen one or two instances of deer browsing. At least the vitex is blooming at eight feet and higher, so I don’t have that to worry about. The puzzling thing is that I haven’t seen a single instance of the deer eating the h…a (the name that cannot be spoken in the presence of deer). They’ve gone crazy over them in the past, so I am standing by for the worst. I can’t put all the h…a in pots on the screened porch. I will try to keep all informed…and keep from crying. This entry was posted in Gardening, Nature and tagged chaste tree, clematis, coneflowers, Coreopsis Creme Brulee, deer, liatris, liriope muscarii variegata, rabbits, Violet Flame phlox, vitex. Bookmark the permalink. John, I feel for you, I think they read the price label and go for the expensive ones! Not having experience of deer in the garden, I can;t help there, but we had rabbits breeding in the garden with their home in one of our banks. You can imagine lots of cute tiny bunnies can’t you. Someone moved into the village with a cat which thought our garden was a happy hunting ground. It caught all the baby rabbits and took them home and then thank goodness the parents decided that my garden wasn’t a safe place to bring up their families any more, I never saw them again! I think you need a hunting cat for your rabbit problem. Try planting society garlic in your flower beds. The deer around here(Lake Norman, NC) do not like the smell. How many do you have to plant? I have a pot of them but they are not out in the garden proper. Plant the society Garlic about every 8 feet around the perimeter/exposed side or mixed with free standing beds. Lowe’s was selling them in flats several weeks ago. They do divide well. I enjoyed your book. I wrote down the formula for daylilies and hostas. I loved the part on rescuing plants from an old home site. I’ll keep that idea for future use. I use swiizzle sticks to mark my bulbs like your friend. It has saved my diiggng up ,many a bulb. I have a gardening blog,too. floweralley.wordpress.com. I just started it last month. I am a former Biology instructor. I will give that a try. I am so pleased you have enjoyed my book. It was so much fun to create. I will look for your blog. Thanks. I specifically chose liriope for the edge because I thought it was critter proof . Wrong! I will try some “fragrants’ next year. I guess that deer and rabbits have a choice of 31 flavors too. They can’t all like strawberry. Oh John, that is such a shame and I can really sympathise. The predators here are much smaller (slugs and snails and mice or voles) but can do as much damage. 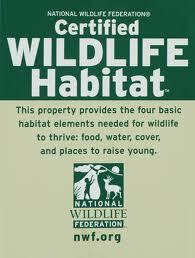 The only answer is to stay calm and plant more – some for the wildlife and some for you! And focus on the beauty that has not been nibbled in your garden, as I am sure there are some highs too. By the way, the untouched Liatris may have been ‘marked’ by another animal and has therefore remained standing. I do hope the deer leave your lilies alone! All the best! Thanks for the encouragement. I failed to mention the slugs, and voles, and Japanese beetles. But I will try to look on the bright side. Not sure I have kept the trap that doesn’t hurt the rabbit. We caught a bunch in the Durham garden and I drove them out into the country and let them go. Heart trap or something like that. I bought it at Southern States. Go forth and do battle. I am going to look for a Have-a-Heart trap. I am girding. What a sad tale! There’s no accounting for the tastes of critters, is there. At the moment ours are at bay, but I always touch wood when I say (or even think that). I think Cathy’s absolutely right – stay calm, keep optimistic, and plant more. Re the deer – I used to have a problem with muntjac deer in a previous garden (they are a very small Japanese species and loved my hostas – we lived in a wood). And then, one New Year’s Day, I woke up (very late) and found the head of a baby muntjac next to my bed. I’m really not pulling your leg … my fiercest cat was the culprit. We saw less of them after that. I’m also told lion dung works with deer? I guess I have to take the attitude that they were here before I was. Am I the interloper? I don’t want to ask how they collect the lion dung. Thanks for the tip. I went on the website and there is a dealer for it locally. Oh John, how disheartening but I agree with Cathy too, we have pidgeons and voles and a couple of years ago a neighbours large pigs got out and churned up the front lawn. Perhaps my next book should be entitled “Critters I’ve Known!,” a collection of critter victories and defeats from all over the world. Everyone could contribute.